The Mujahideen have gained even more victories recently in the provinces of Helmand and Konduz, repressing enemy forces and capturing large swathes of territory. 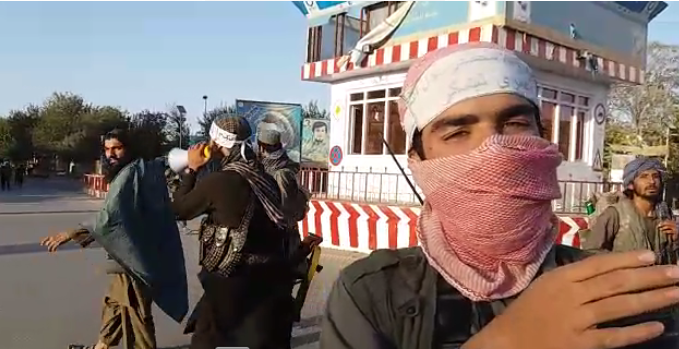 The Mujahideen began a two-pronged pincer assault on Konduz city two days ago. After capturing the outlying suburbs they entered the city proper. At the moment the Mujahideen and enemy forces are struggling for the control of the city square. Similarly in Konduz’s neighboring province – Baghlan – the Mujahideen have taken great strides surrounding the provincial capital as well as blocking the main highway leading from Kabul to Konduz. The Mujahideen have captured a large military base in Dand Ghori district adjacent to the provincial capital. In Helmand, the Mujahideen fighters have captured the districts of Nawa and Khanashin and entered the northern entry point to Lashkar Gah. The Mujahideen also captured a military base in Garmser district. The enemy retreated from the base leaving a large cache of weaponry behind. It is worth noting that in addition to the three provinces mentioned above, the Mujahideen have also completely surrounded the provincial capitals in Uruzgan and Farah provinces. They are relentlessly attacking these centers threatening an imminent collapse of regime forces. At a time when the Kabul regime is duping the world in conferences regarding their military strength, the Mujahideen are threatening whole districts and capturing territory at a dizzying pace. The foreign occupiers have also mobilized their air power to break the siege of provincial capitals but so far they have failed to daunt the valiant Mujahideen fighters. The victories of Mujahideen at the onset of the Brussels Conference send a clear message to the regime and its financial backers. No matter have much support you provide, no matter how much you prolong the suffering of our people, the valiant people of Afghanistan will never back down and surrender their freedoms. We will continue our struggle and intensify our attacks until we destroy your myth of invincibility and prove once and for all that the resolve of a nation united can never be broken.